Remember when I told you guys about my puff pastry obsession about a week ago? Well, it continues with this recipe! Like I mentioned last time, I love the easiness of frozen puff pastry. 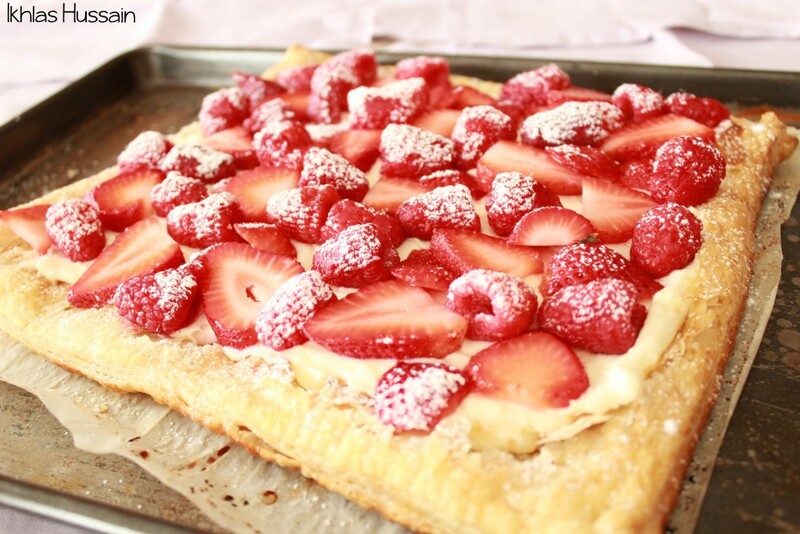 I usually have some in my freezer and it’s so easy to defrost and whip up into something amazing, like this Very Berry Summer Tart. It’s finally getting warmer here in Toronto and the temperature is going to be finally picking up (although apparently there’s a frost warning tonight. At the end of May -_-). 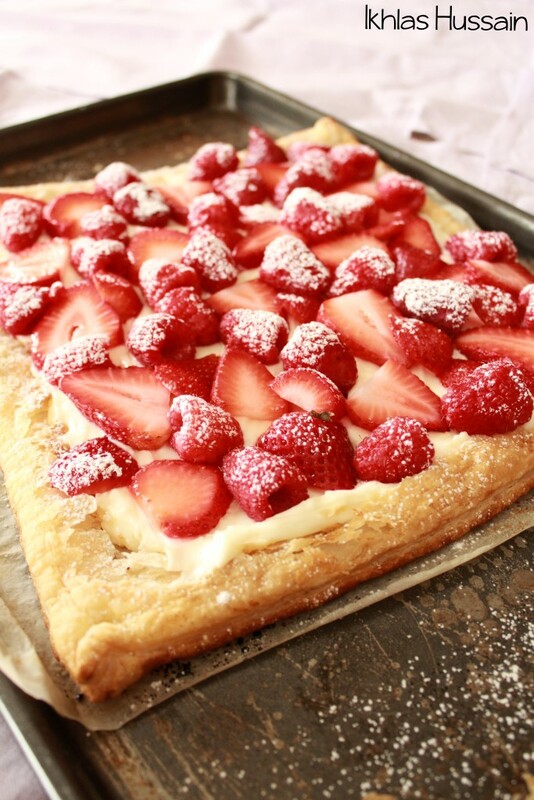 Anyways, nothing quite says summer like berries! I love fresh berries, especially strawberries and raspberries. The combination of them makes me drool, because one is usually sweeter and the other is slightly more tart. Paired together with icing sugar on a cheesecake filling? HEAVEN. Preheat oven to 425 degrees F. Line a baking sheet with parchment paper. Unroll puff pastry onto baking sheet and, with a fork, dock holes into the pastry, leaving one inch around the sides (which will be the crust). Brush with melted butter and sprinkle sugar on top. Bake for 15 minutes or until pastry is golden brown. In the meantime, mix cream cheese, sugar, sour cream, lemon zest, and lemon juice with a mixer until creamy. Refrigerate for 30 minutes. When the pastry has cool, spread the cheesecake filling evenly over the crust. 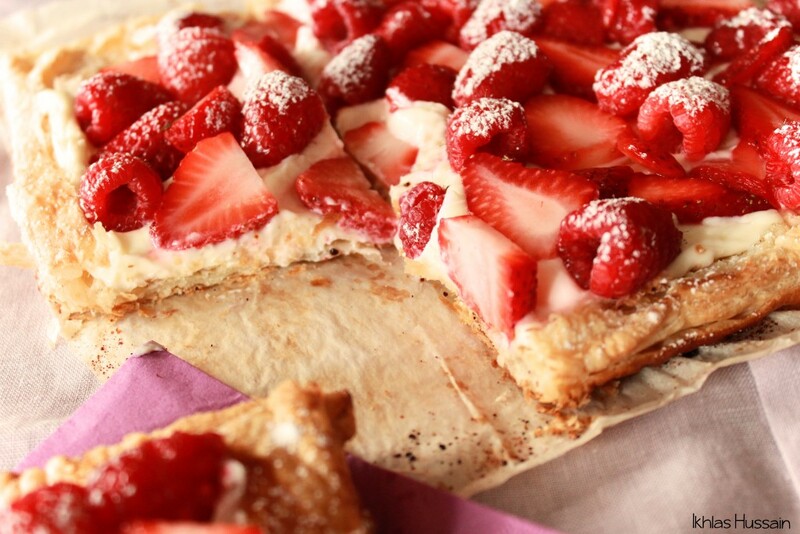 Cover with berries and sprinkle with icing sugar. Recipe inspired by Jessica Burns. The original recipe also calls for docking the pastry, which you do by poking the pastry with a fork the parts you don’t want to rise. I did that, but for some reason my pastry still puffed up. If this happens to you, don’t fret; it can be mixed. I added more berries than the original recipe called for, but there’s really no rule for how many berries you have to add. If you like more, there’s definitely room to squeeze in as many as you can fit! This recipe is so light and fresh; I love it! 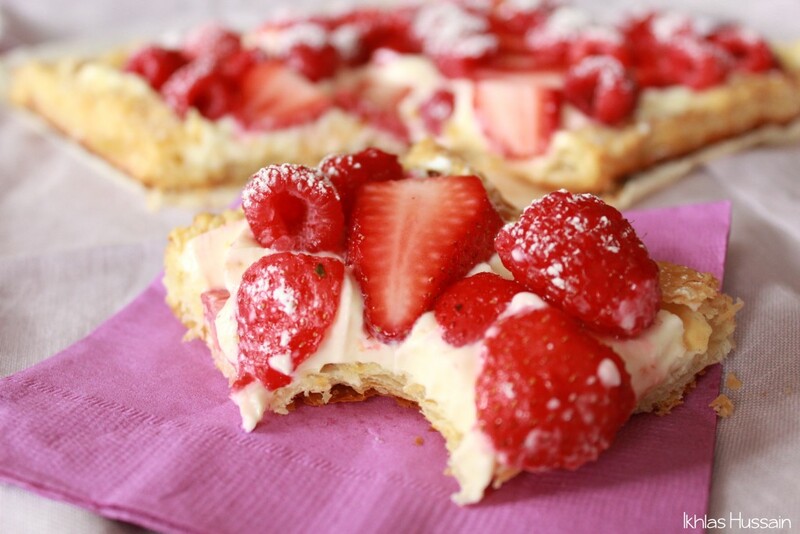 The crust is light and flaky, while the filling isn’t too heavy but instead creamy and a little bit tart. 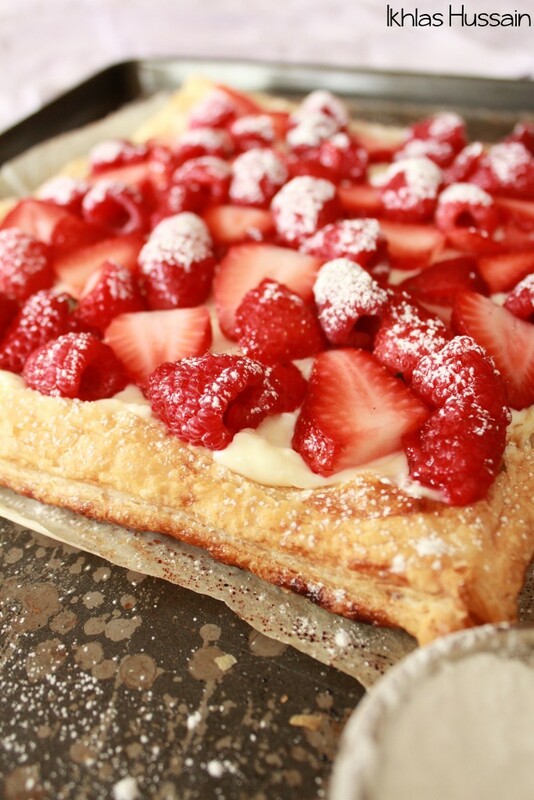 On top of that luscious, dreamy filling are fresh berries that just taste like summer. If you want to add some more variety, feel free to include blackberries or blueberries. It’d be a lot more colourful, that’s for sure. 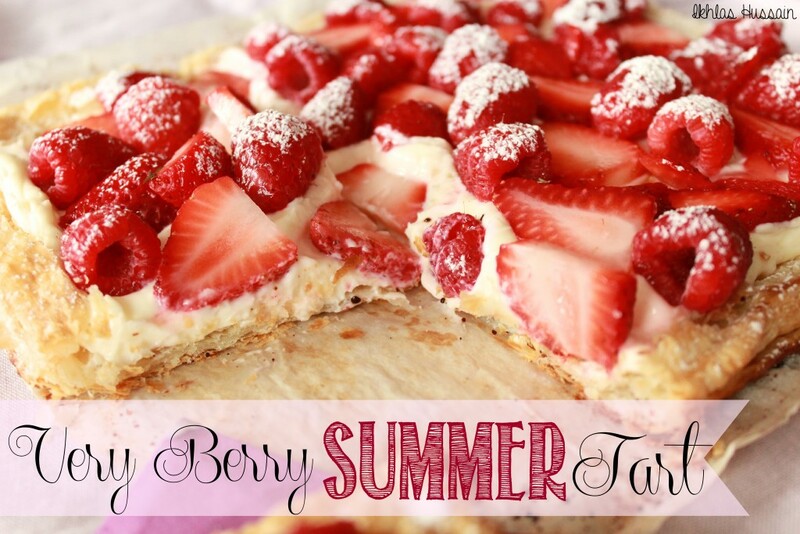 So if you’re looking for a simple dessert that’s sure to impress, do try this easy Very Berry Summer Tart for something light and refreshing. This entry was posted in Cakes and Breads and tagged recipes, sweet. Mmm that looks delicious! It will definitely be a perfect summer treat (once the stupid weather decides to cooperate)!